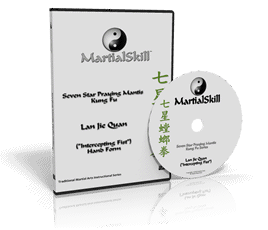 This 2-disc instructional DVD video (containing nearly 4 hours of video content), from MartialSkill.com’s Seven Star Praying Mantis Kung Fu Series, covers the Lan Jie Quan (aka Lahn Jeet or Lahn Dzeet — in English, “Intercepting Fist” or “Intercepting Boxing”) hand form, one of the original sets of the Seven Star Praying Mantis Kung Fu (Tang Lang Quan/Tong Long Kuen) fighting system. Lan Jie Quan, typically taught as an intermediate or advanced form, is considered by many mantis scholars to be one of the original or “mother” forms of the system developed by system founder Wang Lang over 350 years ago. The Lan Jie form contains within it all of the praying mantis systems’ original seven long and eight short attacks, and emphasizes trapping/intercepting motions in both the handwork and footwork that seek to interrupt an opponent’s flow and timing. The form employs advanced footwork, including double stepping motions that teach students effective “closing the gap” techniques and support the form’s timing-interruption techniques. In this DVD, instructor Sean Daily along with Carlos Lopez and Pat Brown (all 10+ year mantis practitioners) take viewers step-by-step through the form’s various techniques, footwork, and handwork, and demonstrate practical hands-on applications for each motion. Techniques are shown at multiple speeds to allow viewers to understand subtle nuances in addition to the basic motions.